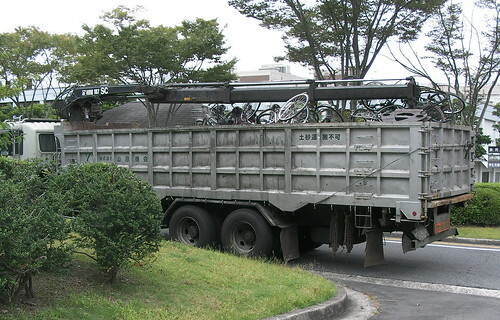 The Dark Side of Japanese Recycling: The Lack of Reuse, a photo by timtak on Flickr. Japanese recycling is thorough. We have to separate our garbage into several types: cans, bottles, plastic, paper, burnable, poisonous, large etc. But when someone throws away a bicycle, it is against the law to take that bicycle from the garbage dump and ride it away and keep it. The bicycles are not reused, but recycled into steel. The Japanese are avid recyclers. Reuse is very much more environmentally friendly than recycling the raw materials but the Japanese are not nearly so keen on reuse. I can think of two reasons for this. Japanese people have a bit of a phobia about second-hand. Things are seen as becoming imbued with some psychological or spiritual aspect of their own, and of their owner. This Shinto related, animistic phobia is dwindling and the use of second hand things is becoming more popular. Secondly the Japanese have a tendency to see the world as being made up of material rather than items. When Japanese look at things, from bicycles to pieces of plumbing (which of these are identical to you? ), they see the material rather than the item itself. They are influenced in part by the Japanese language (M. Imai & Masuda, in press; M. Imai & Mazuka, 2007; Mutsumi Imai & Gentner, 1997; Mutsumi Imai, Gentner, & Uchida, 1994) in which nouns are almost all akin to English uncountable nouns, like "sugar," "flour," and "water," that is to say designating materials. Imai, M., & Mazuka, R. (2007). Language-Relative Construal of Individuation Constrained by Universal Ontology: Revisiting Language Universals and Linguistic Relativity. Cognitive science, 31(3), 385–413.